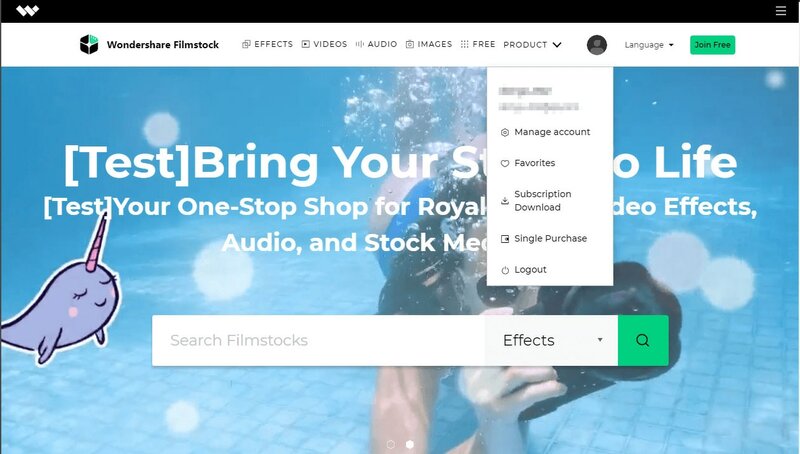 The previous Filmora Effects Store is now Filmstocks, which is a one-stop shop for stock media including video effects, stock footage and photos, and royalty-free music and sound effects. You can download and use the resources in both Filmora9 (version 9.1 or above) and other video editing softwares like Adobe After Effects. In this guide, we will show you how to access Filmstocks and apply video effects and media assets with Filmora9. Video creators at any skill level can make spectacular videos with these stunning effects. Note: To use video effects in Filmstocks, please update Filmora9 to the latest version (version 9.1 or above). Where to find My Filmora Effects in Filmora9? Currently, you can access Filmstocks directly from Filmora9 or through the Filmstocks website. Launch Filmora9 Video Editor and click New Project to enter the main interface. Click the Account icon and enter your Wondershare ID in the pop-up window to log in. 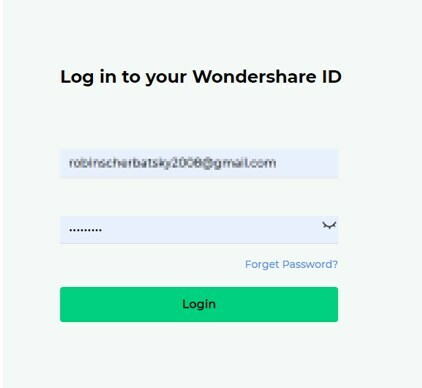 Note: If you don’t know what a Wondershare ID is and how to get it, you can check our guide on How to create a Wondershare ID here. Click the Download Arrow icon located in the upper right corner to access Filmstocks directly. Note: Your downloaded video effects will only be available when you are signed in to your account. Click the Login menu and enter your Wondershare ID login information. To check your account information, including your order history, favorited media, downloaded assets, and account settings, click Manage account. Note: It is highly recommended to log in to Filmstocks and Filmora9 with the same Wondershare ID. How to Download Video Effects from Filmstocks? If you access Filmstocks from Filmora9 video editor, you will see the default video effects collection for Filmora9 as shown below. You can choose to sort the video effects by “Most Recent” or “Most Popular.” You can also choose to filter them according to the libraries (Free, Standard Library, Premium Library) and categories (Lifestyle, Food, Makeup, Gaming, Travel, Wedding, Cinematic, etc.) they belong to. Additionally, you can find effects by typing related keywords into the search field. Select the effects that you want and click the Download icon in the thumbnail to start downloading. If you want to learn more about this effect, click the thumbnail of the video effect. The details displayed on this page include which version of Filmora9 it is compatible with, its file size, which library it belongs to, and what types of effects it contains (i.e. filters, titles, transitions, overlays, etc.). This page will also include a video demonstration of what the effects look like in action. 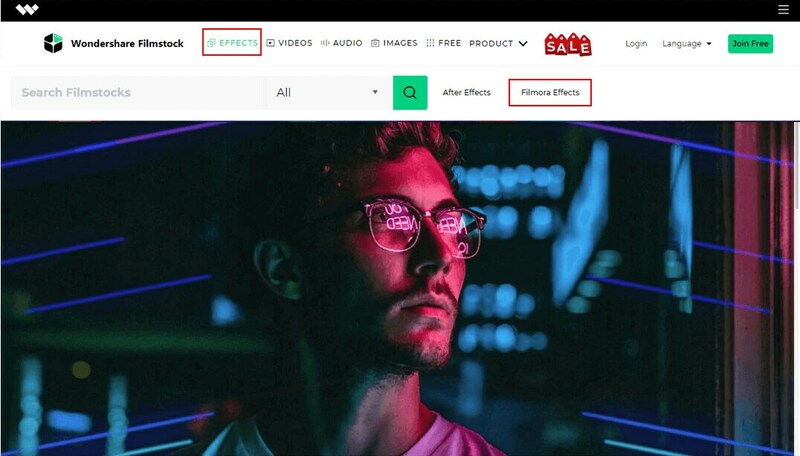 Click the Free Download or Download Now button and the effect will be added and downloaded automatically to the My Effects list in Filmora9 video editor. Note: If your subscription expires, you will lose access to the video effects you installed in Filmora9. However, if you are downloading AE video effects, stock footage and photos, and royalty-free music and sound effects from Filmstocks, you can access them on your computer at any time. If you want to access Filmora effects from Filmstocks, click the Effects menu tab and select the Filmora Effects option. Filmstocks provides several video effects which you can download for free. You can download the Filmora video effects and media assets tagged with the icon. 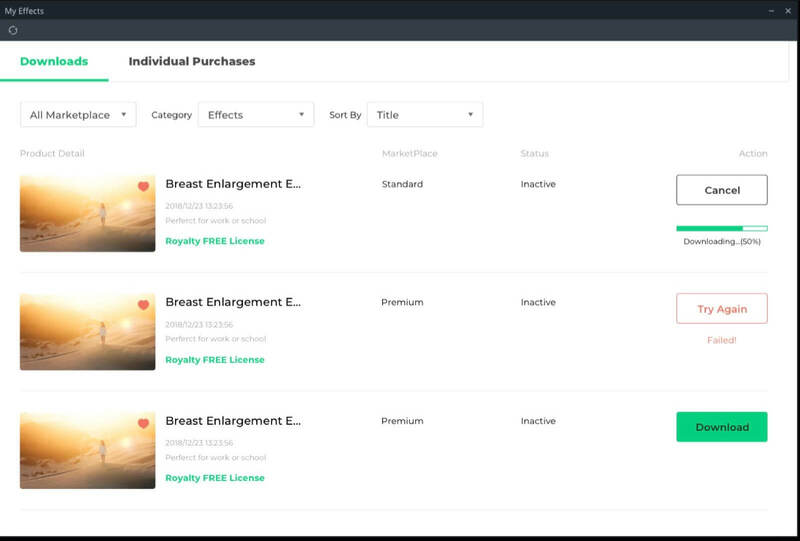 You can also change the Library type to Free in the Filmora Effects page: https://www.filmstocks.com/c/effects-filmora-effects.html. If you are looking for more media assets that you can access for free, you can easily find them by visiting the Free media assets page: https://www.filmstocks.com/free.html. 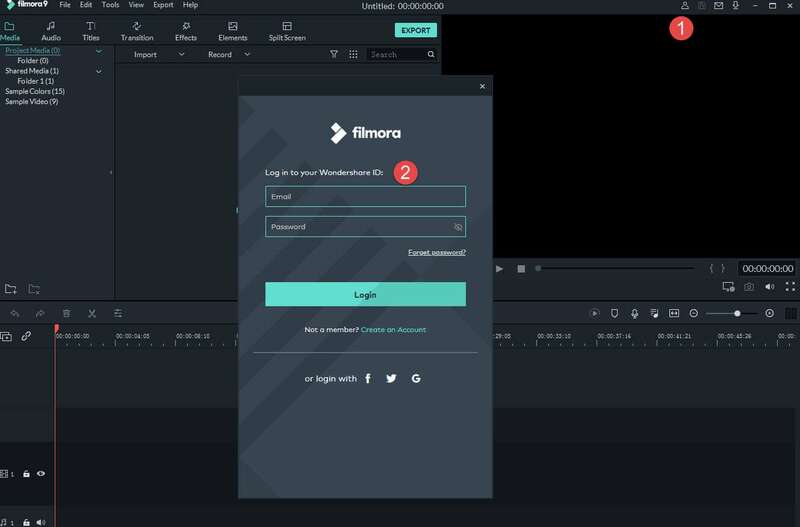 To find your Filmora Effects in Filmora9, click the Account icon and you will see your Wondershare ID, your Filmora9 subscription plan, as well as My Effects. Click My Effects option and you will find the downloaded effects in the Downloads tab. Note: If you are already subscribed to a monthly, quarterly, or annual plan to the Effects Store, you will see your previously downloaded effects in Individual Purchases. The newly downloaded effects will be sorted into the correct sections of the program (Audio, Title, Transitions, and Elements) and marked with a red dot. To find other media assets such as stock video footage, photos, audio, and AE video effect templates, you can go to the downloads folder on your computer. In the Account Center, select the Overview tab to see your plans, the status and expiration date of your plans and an option to Cancel Subscription. Click Cancel Subscription. You will see all your plans in Order History. Choose the Plan that you want to cancel and click Cancel Subscription to discontinue your subscription. Submit the survey and click Submit & Unsubscribe to confirm your cancellation. 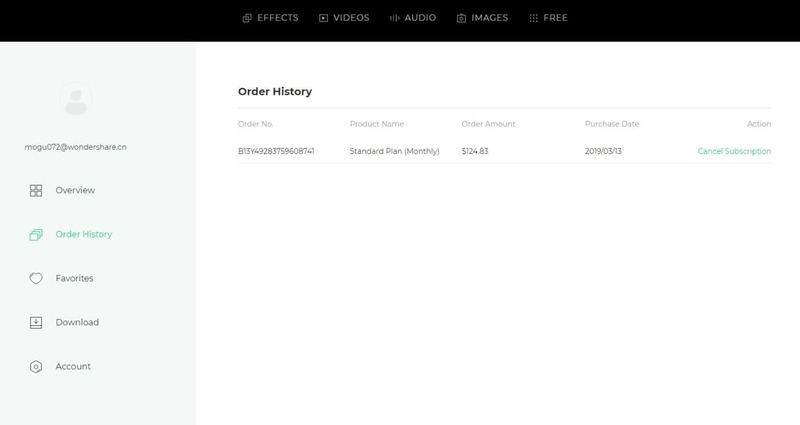 If you have purchased the Filmora9 Business Plan, you can use Filmora9 and effects (except music tracks) for commercial use. 1. Built-in effects found within the Filmora9 program (including music tracks, transitions, text and titles, sound effects, etc.). All music tracks provided in Filmora9 program are for personal use only – not for commercial use. Other effects like sound effects, text and titles, etc. can be used for commercial use only if you purchase Filmora9 business license. 2. Add-on Effects sold in Filmstocks, including video effects, video footage, text & title effects, filters, music, sound effects, images and photos, etc. Media assets sold in Filmstocks are all made by VBROADCAST designers. All rights reserved to VBROADCAST. By purchasing a Standard or Premium library, you can use media assets for commercial use unless they have a print run of more than 500,000 copies or reproductions.